Giveaway: Let My RV Go! A Frum Pesach Novel. Well, Pesach is just two weeks away! Some of us are up to our ears in preparations, and others of us are still in denial waiting a bit longer to begin. My friend Ruchi has an excellent post on doing Pesach cleaning in one day and maintaining one’s sanity. Chaya Kurtz has a guest post on Pop Chassid about the importance of cleaning for Pesach without stress and misery. I agree. We don’t need to go crazy, and dust is not chometz. That said, I did find the turning over period, where some rooms were clean for Pesach and others weren’t, a bit stressful. I should’ve used Ruchi’s method! Anyways, imagine if all you had to clean was the kitchen of an RV? That’s all the protaganist in Nicole Nathan’s new novel has to clean. But she has some other dilemmas, like parenting a number of small children in an RV on a long road trip, and how to get a box a matzah that was foisted on her by an unknown man to its recipient, whose address she doesn’t have. 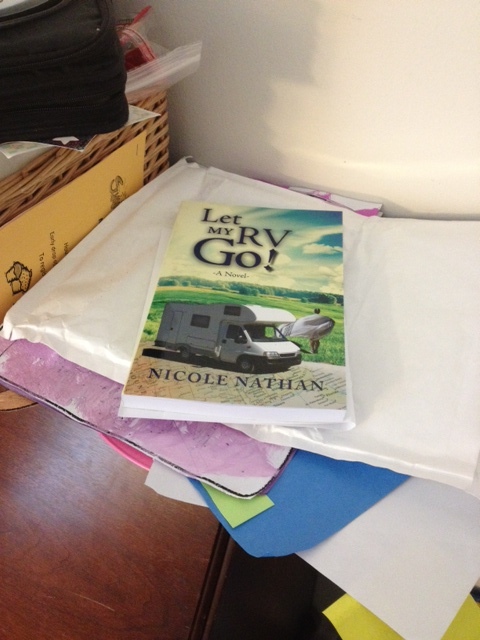 I was contacted to do a giveaway of this new frum novel, Let My RV Go! The book is sitting on my (cluttered) desk, just waiting to be mailed off to the winner of this giveaway. So, to enter, just leave a comment telling me your favorite, or least favorite, part of the house to clean for Pesach. The giveaway will end at midnight on Sunday, March 17th. I will contact the winner via email, so be sure to leave your email address in the comment form! Let the Pesach Prep Begin! for me it’s the basement. everytime we get a box from ups or usps, I toss it down the basement stairs, just like I do with trash. However, hubby takes OUT the trash every week. the boxes just sit there until I get around to breaking them down for him. Guess what’s on my to do list this week? ugh. :) I would LOVE this book, thanks for the giveaway! happy Pesach prep! My favorite place is my bedroom- no chometz in there, and I get to re-read all my old journals!! I love the feeling I have after I clean my fridge and freezer…..I just did it tonight! YAYY! My least favorite room is the kitchen. However, I do enjoy the workout that cleaning it entails! My favorite part of Pesach cleaning is the kitchen – it always feels so special, because it’s the final part of the work, comes no more than a few days before Pesach, and always feels so clean (and different) afterwards. My least favorite is whatever it makes most sense to do in the first week or so. B-O-R-I-N-G. And, usually not real cleaning, or even that necessary. My first time doing Pesach (after 4 years of getting out of it) and actually now that the fear factor is out of the way, I am really enjoying this! And no, I am not a domestic person by nature, but it’s a nice feeling to get my house under control. I hope to read all the posts soon!! With ka”h 8 under the age of 14…. There’s a lot to do before Pesach!! But what I’m dreading the most are my fridge and oven!!! !